What kinds of things will we do in class? In class we sing, dance, chant, and play along with instruments to a variety of musical styles, melodies and rhythms. You and your child will also participate and experience creative movement, improvisation, finger play and lap songs. Above all else, we have fun while creating a rich and lively musical community. All children are musical. The same way that a child has the innate ability to speak and understand his native language, he also has the ability to do the same with the language of music. Do you wait to talk to your child until you are sure that he can answer you back? He talks when he is ready, because he has been immersed in a language from birth. He walks when he is ready because he has felt your movement while in your arms. Giving a child this same kind of immersion in musical experiences will provide him opportunities to not only learn to sing in tune and keep a steady beat, but to develop his own special way of expressing music through movement. May I bring my 3 year old as well as my 10 month old to the same class? Not only may you, but we encourage it! Research shows that preschoolers learn best in a mixed-age environment. The little ones learn by watching and imitating the older children. The older children love being the big kids showing the little ones how it is done. This family-style learning environment facilitates participation and involvement in the music for every child, at whatever developmental stage they may be. Because you are your child's most important role model, she will learn best by watching you and listening to you. 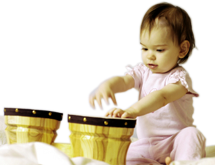 Therefore, your participation as a music-maker is vital to your child's developing love of music. I am tone deaf! Won't I ruin my child musically if I sing to him? No! 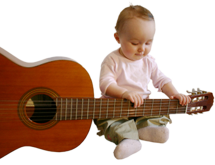 We promise that you will not hurt your child's musical prowess by singing to him, even if you are not always in tune. He will hear plenty of "in tune" music through other mediums, but your voice and your presence are most precious to him. What you (and/or other primary caregivers) do, he wants to do too. Although we, as teachers, are able to help your child learn skills, your child must gain the positive disposition toward active music making from you. My child just sits there in class (or my child just wanders around in class). Is my child bored? There are many different learning styles. Some children may be visual learners who need to watch before they experiment on their own. Others are auditory learners who are listening, even when they are across the room. Kinesthetic learners need to move! Tell a kinesthetic learner that he can't move and you are actually hurting his learning process. Therefore, a child's learning in class happens in a multi-layered way - through active participation, watching others move, experimenting with instruments and even by just being there and listening to you sing. Instead of waiting for your child to do something in class, let yourself go and do it yourself. Then, watch and listen to her at home, and you will see and hear how much she is learning and absorbing in class! There are nine song collections. A different song collection is used each semester, so when you register for your next semester you can look forward to new songs and chants, taught with the same kinds of activities. Because your child will be at a different place developmentally, an activity will be exciting to him whether it is because of its familiarity or because he can grasp it in a new way. What if I didn't start in the Fall? Has my child missed something? Because the semsters are non-sequential and the activities are designed to be accessible to a child at his own developmental stage, a child can enter the Music Together® program at the beginning of any semester and at any age. Look at our class schedule and find a time and location that works for you and your child. Click on "classes" near the top of the page and then click on "Registration & Class Fees." Fill out the registration form and follow the prompts to pay on-line.